Germany's 4a Architekten creates the ultimate in oasis spaces with their new floating river sauna. Part of the Emser Thermal Spa, the beautiful 250 m² floating sauna establishes a compact and tranquil addition to an already incredible location. 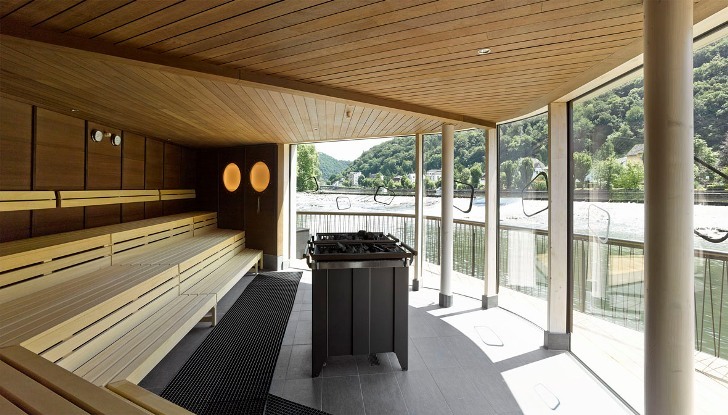 The Emser Sauna is the first river sauna to be open year round in Germany and from the looks of it, will be a steaming success. Depth variations on river Lahn presented a challenging task for the architects. As a solution, the sauna was built as a floating pontoon structure using 20 rectangular floats supported by a steel framework. The structure is securely connected to land with hinge-mounted steel cylindrical tubes. The larchwood-clad exterior of the sauna was chosen by the architects to complement the natural surroundings. On the interior, a soothing combination of brushed alder and abachi wood slats were used on the walls and ceiling. Polished anthracite-colored porcelain stoneware and glass-mosaic tiles decorate the common areas throughout the building in order to create a cohesive atmosphere of well-being. Inside the compact structure, visitors can relax in one of the two Finnish saunas with floor-to-ceiling windows, a relaxation room with a bar, and a sundeck that offers stunning views of the surrounding river landscape. Depth variations on the river Lahn presented a challenging task for the architects. As a solution, the sauna was built on a floating pontoon structure using a steel framework to support the 20 rectangular floats. The structure is securely connected to land with hinge-mounted steel cylindrical tubes. The larchwood-clad exterior of the sauna was chosen to complement the natural surroundings. On the interior, a soothing combination of brushed alder and abachi wood slats were installed as well as anthracite-colored porcelain stoneware and glass-mosaic tiles that create an atmosphere of well-being. Inside the compact structure, visitors can relax in one of the two Finnish saunas, a relaxation room with bar, and a sundeck that offers stunning views of the surrounding river landscape.